NextDegrassiBlog Q&A 8/13/15: Winston, Eclare, etc. The main buildings at Epitome Studios were originally a printing plant. 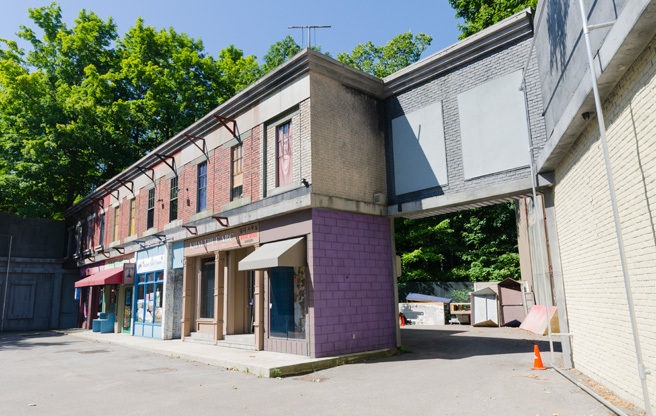 Later, they were converted into the sets for Riverdale, a primetime soap that ran on CBC for three seasons. Degrassi: TNG took over in 2001. 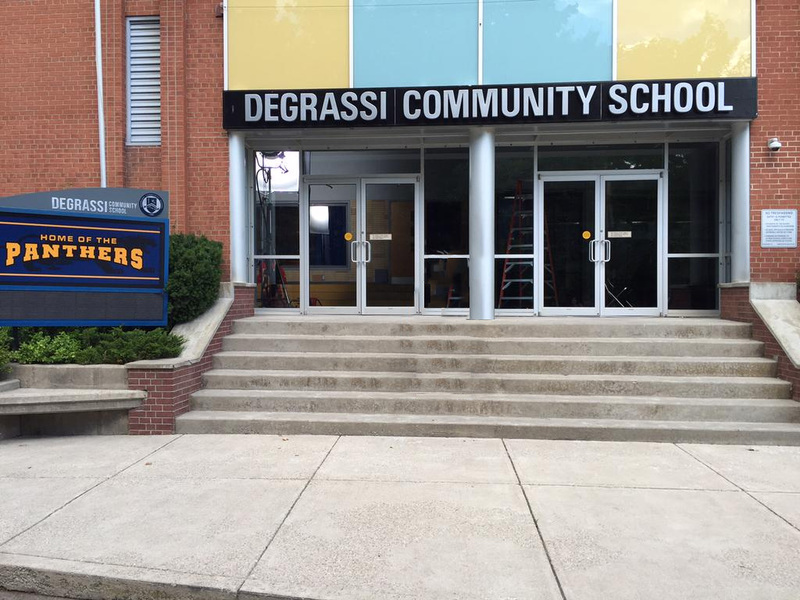 (Front steps) This is where visitors to the Degrassi set tend to want their pictures taken. There are no official tours of Epitome’s backlot, but fans arrive at the front gate from all over the world. The show’s producers try to oblige with impromptu tours, sometimes conducted by cast members. The LED sign and the banner are upgrades for the new series. 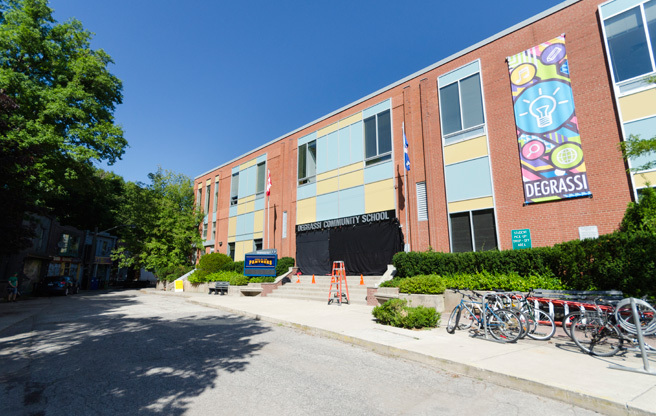 Set designer Stephen Stanley says that the graphics and overall look of Degrassi Community School have been made cleaner, sleeker and more modern for Degrassi: Next Class. 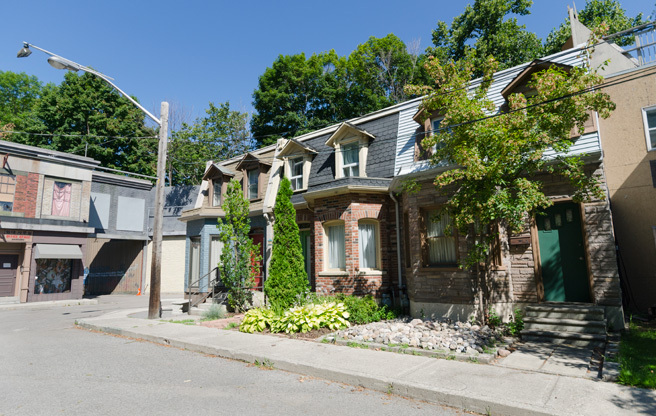 Just a few metres away from the doors to Degrassi Community School is a group of residential home facades. They’re barely a room deep, and once you walk through the front doors you’re only a few steps away from the next set over: a swimming pool. 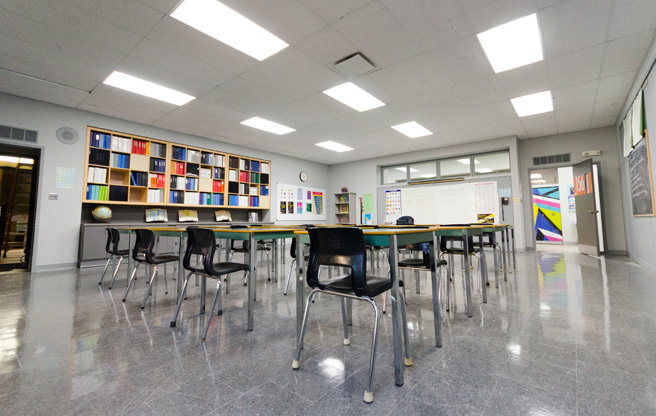 This schoolroom set has been used in every episode of Degrassi: TNG for 15 years. Degrassi creator Linda Schuyler is a former teacher, and she’s a stickler for making sure the school sets are accurate. Textbook publishers supply Degrassi with books for product placement. For the new series, they’ve been arranged not by subject but by colour. Set designer Stephen Stanley says that Degrassi Community School has entered the “post-book age.” Expect more digital screens in the new series. Also, you can spot the new color scheme of the lockers in the doorway to the right. Is it just me, or did the set in TNG look more “lived in”, like an actual real world school? This almost looks a little too much like a set to me. Sadly, this is how schools are looking now (the newer ones). And with Degrassi going through many upgrades, it totally fits lol. I’m excited to see the final product, but I’m not impressed by the preview of this new set. It doesn’t feel or look like a real school anymore. That was one of the things I really respected about the set design of Degrassi: The Next Generation/Degrassi. Cant wait..this looks great. Modern and fresh & im excited to see this new batch of episodes. And in response to Cody, alot of high schools dont look the way they did when I was in high school…things change including everything down to classrooms and this is going to be a bold new dope look for Degrassi, cant wait. I guess that’a true, I haven’t been in high school for a few years now. Things do change. Though, my high school hasn’t changed much in terms of aesthetic. I guess I’d also argue that in a big city like Toronto, they likely wouldn’t have the funding to renovate a school so quickly and dramatically. I guess we’ll have to see how I feel down the road! I guess some schools might look like this, but mine didn’t and I graduated 2 years ago. To me it just looks like a set, which TNG set never did. Oh well. I kind of disagree. the TNG set started really looking set-esque when they started using better cameras in season 10.